On Wednesday, the Bicycle Coalition testified at a hearing of the Transportation & Utilities Committee on electric scooters. 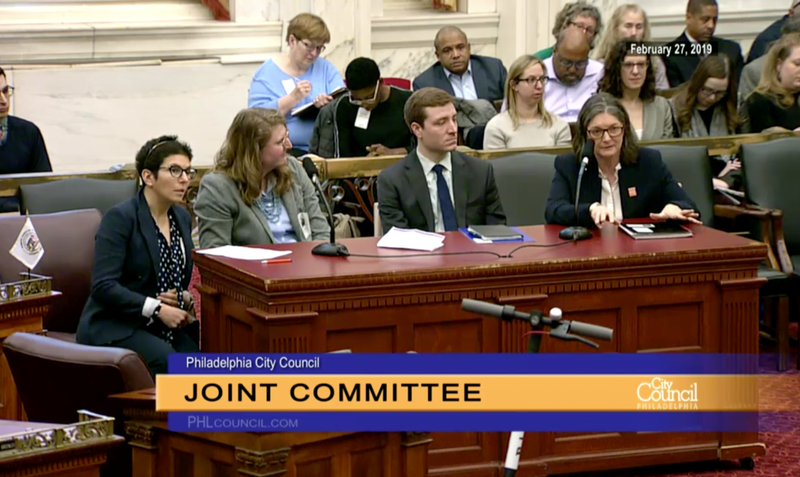 We expressed support for a pilot program for e-scooters given that it is a new type of “micro-mobility” that can positively impact the inequity of transportation options that many Philadelphia neighborhoods still experience. Our testimony also listed a number of issues and best practices that we expect a pilot program to incorporate. Read Sarah Clark Stuart’s full remarks here. The hearing featured other testimony from the Clean Air Council, Bikemore and representatives from Lime, Bird and Spin. Officials from the City’s Office of Transportation, Infrastructure & Sustainability and Health Department testified that their concerns about safety have led them to want to delay any pilot for at least a year. Articles about the hearing can be found here, and here. One point we made at the hearing was the City has not yet released a permit or regulation for dockless electric bicycles, which we urged Mayor Kenney to expedite as soon as possible. Meanwhile, a bill to legalize electric scooters was introduced in the General Assembly yesterday by Representative Greg Rothman. In an effort to better understand what a city with electric scooters looks like, the Bicycle Coalition is organizing a site visit to Baltimore for Monday, April 1st. If you are interested in being part of this fact-finding mission, please register here. We will rent some vans, drive to Baltimore and spend the day visiting with elected officials, Baltimore City Department of Transportation staff, representatives of operators Lime and Bird, Bikemore staff and others to learn more about what their experience with electric scooters has been like.